Claude Monet is an artist. On 12 November 1918, the day after the Armistice, the painter Claude Monet wrote to Georges Clemenceau, Prime Minister and his friend of almost thirty years: “I am about to finish two decorative panels that I wish to sign on the day of Victory, and am asking you, through your kind assistance, to offer them to the State… it’s not much, but it is the only way I have of taking part in the Victory. […] I admire you and embrace you with all my heart”. The Musées d’Orsay et de l’Orangerie, in partnership with the First World War Centenary Group, and as part of the Clemenceau "Father of Victory" 1918-2018 commemorative year, are organising a Monet – Clemenceau focus to be presented at the Musée de l’Orangerie from 12 November 2018 to 11 March 2019. The Focus aims to illustrate the links that existed between Claude Monet (1840-1926) and Georges Clemenceau (1841-1929), both from a personal point of view and against the background of the First World War and artistic creation. The Focus will mainly adress the Great Decorations project of the Water Lilies in the Musée de l’Orangerie, a work that crystallises the links and ambitions of the two men, with the aim of bringing together art and nation at a crucial moment in history. It will be held in a specially reorganised gallery of 40m2. 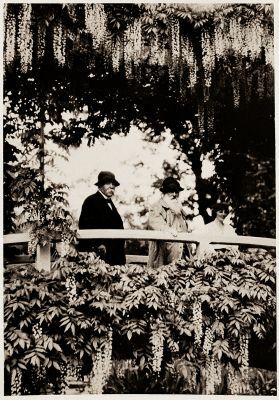 It will include, in particular, not only portraits of Monet and a selection of his works, but also portraits of Clemenceau, including a bust of him by Rodin, letters, a plan of the Orangerie from the National Archives with the final design of the rooms for the Great Decorations, personal objects revealing the friendship between the two men, photographs and printed material. This exhibition was organised by the Musées d’Orsay et de l’Orangerie, Paris, in partnership with the First World War Centenary Group. As part of this Focus, the Musée de l’Orangerie is giving the general public the opportunity to take part in a rare experience at the heart of its collections from 14 November 2018 to 11 March 2019: an immersion in the painting of Monet’s Water Lilies, from Giverny to the Orangerie.